This photo was taken on 12/16/17 at 11:40 PM. The "Take It!” came from having finally placed a small clock in a location of extreme convenience for me to refer to while in my "Declier" (ever so comfortable chair). I often get caught up in reading and loose track of time. A big clock on the wall seems to be more of a kitchen item - so, to bring this into the game has been a really cool answer to many a past question. The lamp is one inherited from my parents estate and was retrofitted to accomodate a huge wattage bulb, so that as a single light in the room, I still have plenty of illumination. While knowing my Mother spent many hours reading by this same lighting fixture is not a constant, it is an occasional comforting thought. Here is hoping each of you has such a piece in your own dwelling that you have inherited and use or refer to on a constant basis. Wishing everyone a chance to enjoy what it takes to bring about the pleasure of a good read. Sometimes it is as if a certain spirit is my companion as I engage in this form of enlightenment or entertainment. 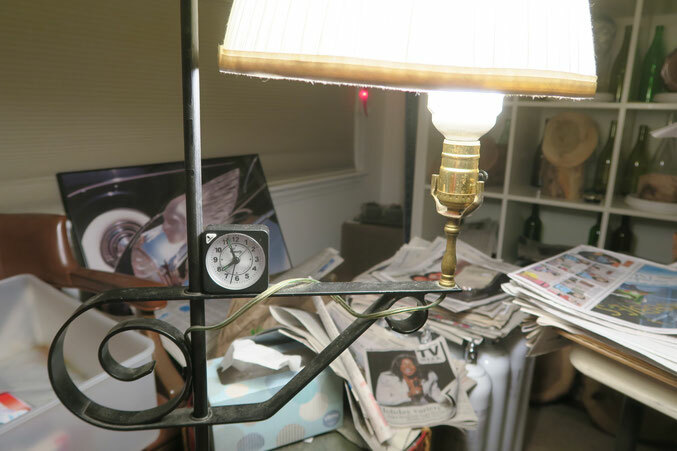 PS: I hope you do not mind that this entry started with a clock, gave honorable mention to a chair and wound up focusing on a lamp. It is the taming of random by making it a constant tandem. I like the concept but don't you have a cell phone to tell the time? That thing never gets knocked off? Man this one took me a minute to find what I was looking at. For some reason I just wasn't noticing the clock, everything else around it.